It may come as no surprise to learn that, due to limited resources, many citizens of poorer countries are forced to eat whatever they can get their hands on. However, when it comes to gross foods, not all are born from utter necessity. You’d be amazed to learn what disgusting things many people eat by choice. And, while some foods can be identified as gross with a simple glance, others aren’t as easily spotted until you learn about their ingredients. Sometimes referred to as ‘maggot cheese’, casu marzu is a Sardinian cheese made from goat’s milk. But what makes this food so disgusting is the way it’s prepared. Early in the fermenting process, the larvae of cheese flies are introduced. Over a period of weeks, the larvae hatch and begin feeding. As the cheese’s fats are broken down, a special flavor is produced which many consider to be delicious. 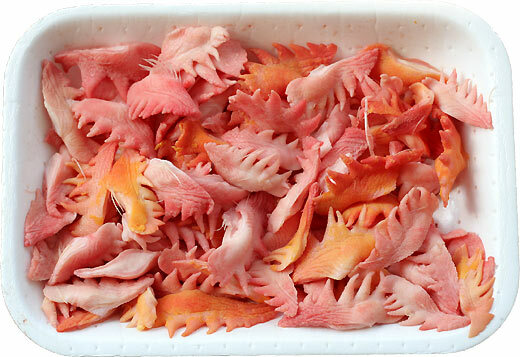 When the time comes for human consumption, many people meticulously remove the maggots. However, some leave them in, believing that they add an extra flavorful punch. If someone placed balut on your plate, you might think they were serving you a hardboiled egg. That is, until you cracked it open and a fully intact duck embryo spilled out. 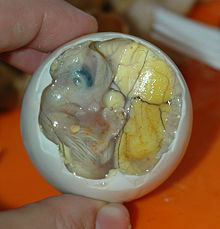 Balut, considered a delicacy in many Asian countries, is produced when fertilized duck eggs are placed in warm sunlight. After about eight days, the eggs are held up to the light and checked to ensure that the budding embryo is ready. Then, the eggs are cooked and served with a dash of salt and a few squirts of lemon juice. 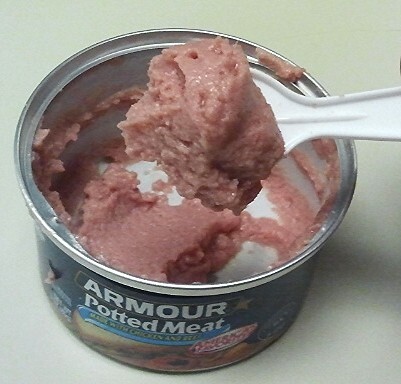 Potted meat is not some strange foreign delicacy. In fact, this inexpensive meat product produced by Hormel is available at most any North American grocery store. However, when it comes to grossness, this well-known product rivals anything you’ll find in a third world country. A check of the ingredients listed on the label is proof enough: mechanically separated chicken, beef tripe, partially defatted cooked beef fatty tissue, beef hearts, water, partially defatted cooked pork fatty tissue, salt, and less than 2 percent: mustard, natural flavorings, dried garlic, dextrose, sodium erythorbate, and sodium nitrite. Yummy! This gross food is also enjoyed in the northernmost of the United States. Preparation is relatively simple: first, the moose‘s nose is removed. Then it’s boiled for a bit until the hairs become loose and can easily be plucked free. After a few spices are added, the meat is boiled even longer until it disintegrates into a gelatinous mass. Finally, it’s sliced and served chilled. 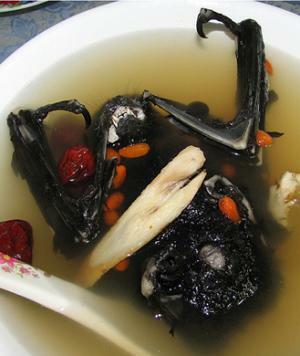 Not bat paste, but still bat soup. A traditional Scottish dish, haggis is really nothing more than a type of sausage. However, this particular sausage is comprised of a sheep’s lungs, liver and heart. Many describe haggis as resembling stuffed intestines more than sausage. However, although they admit it looks unappealing, Haggis-lovers swear that those who are brave enough to taste it will come running back for more. 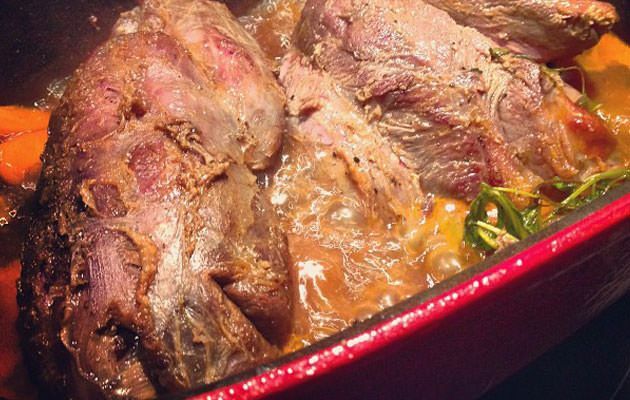 This dish is comprised largely of blood drawn from pigs, cattle or sheep. However, it doesn’t become blood pudding until the blood is allowed to coagulate, a filler of oatmeal, barley or sweet potato is added, and the entire mass is brought to a boil. During the cooking process, a delightful skin is produced atop the goo. While some like to remove the skin before plunging their spoon into the pudding, others enjoy its chewy texture and prefer to eat it last. I have been told that haggis, with bits of smoked bacon mixed in, battered in Guinness tempura and deep fried is amazing! Haven’t tried it myself though. I can’t believe you put in potted meat as the token American food, instead of chitlins (chitterlings): Boiled pig intestines which smell atrocious from a thousand feet away – outside. If you’re lucky, picking out the visible bits and repeated soaking got most of the partially-digested food and pig poop out of the tiny folds.